This post is the fifth of six posts about making our way to Birmingham, Alabama to attend Beeson Divinity School. Here’s the story. In December of 2016, Janie and I made two trips to Birmingham to find a place to live. I could not go with her on the second trip, but she secured a freshly renovated 3 bedroom bungalow not far from Beeson’s campus. Things were moving right along until the landlord backed out. She wanted to sell the property before I would have finished school. We made a third trip and struck out again. We were getting desperate. In a panic, we connected with a friend-of-a-friend-of-a-friend who was a real estate agent. She agreed to find some properties that might meet our needs and tour them over FaceTime with us. From what we could tell, the Cooper Avenue house would be fine. It seemed roomy enough and clean. It was at the top of our price range, but we knew that we weren’t going to do any better and get any closer to the city. We discussed, prayed, and discussed some more. I didn’t want to start 2017 without having a place secured and I couldn’t justify another trip to Birmingham. I signed the lease. It was done. This entry was posted in Seminary and tagged Anglican, beeson, jackson, liturgy, ministry, robin mark, seminary, worship on July 25, 2018 by peenerbutter. At Christ Community Church, we’ve been experimenting with singing the Psalms over the past year or so. We’ve run the gamut from gospel to chant (within the same Psalm). We’ve drawn from a number of resources and traditions and we continue to explore the rich tradition of singing the psalter. Recently I learned that worship leader/recording artist Robbie Seay had embarked on a Psalms project that I think may be worth checking out. It is a very contemporary approach to singing the Psalms. While he doesn’t include the entirety of a Psalm, the compositions are rooted in a particular Psalm. When we read and memorize portions of Scripture, this is often how we do it. We find a verse or short passage that we find meaningful. These selections are great ways to let God’s word seep into our hearts and breathe from our lungs. The project consists of three EPs, the second of which has just been released. They are raising support through Kickstarter to fund the third collection. Volumes one and two can be purchased on iTunes. Below is their Kickstarter video. This entry was posted in Music and tagged liturgy, psalms, worship on May 26, 2014 by peenerbutter. Some books become popular and influential because they have the ability to communicate something profound in an accessible manner. Academic books almost never fall into this category. 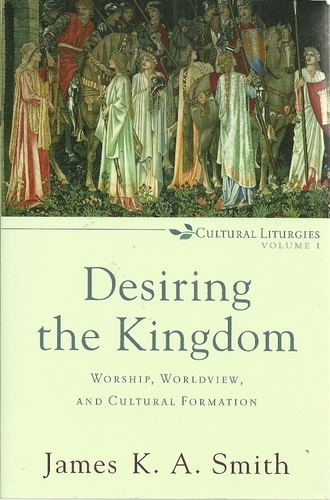 However, James K. A. Smith’s book Desiring the Kingdom: Worship, Worldview, and Cultural Formation may be an exception. That might be an exaggeration but I continue to hear this book referenced and recommended again and again, mostly by academics, of course. While I’m not an academic, Desiring the Kingdom caught my eye for a couple of reasons. First, the cover art is intriguing. I know that sounds lame but it makes sense after reading the book. The title, too, piqued my interest. After reading the subtitle, I knew this guy was speaking my language. This entry was posted in Book and tagged anthropology, imagination, james k. a. smith, liturgy, music, philosophy, sabbatical, worship on July 4, 2013 by peenerbutter.